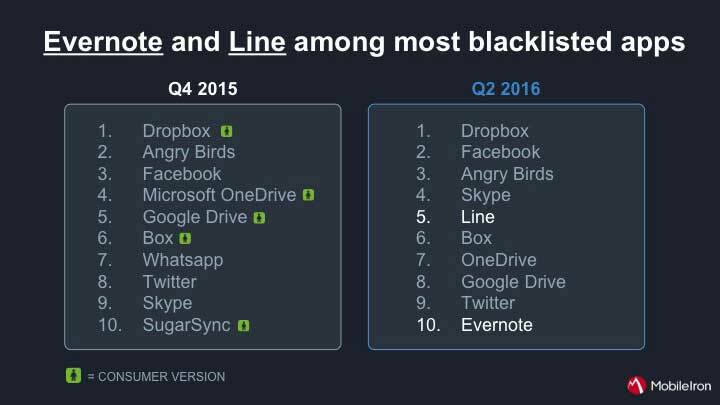 Enterprises continue to fall short when it comes to protecting corporate data on mobile apps and devices, according to the Mobile Security and Risk Review, released today by MobileIron (NASDAQ:MOBL) at the 2016 U.S. Black Hat conference taking place in Las Vegas, July 30-August 4. Mobile threats are on the rise but only 8% of companies are enforcing OS updates and less than 5% are using App Reputation or Mobile Threat Detection software. The second edition of the Mobile Security and Risk Review updates Q4 2015 data and discusses an emerging set of threats and risks, including enterprise compliance failures, compromised devices, and data loss risks. For the first time, the review also identifies enterprise security trends on a geographic regional basis and for the government vertical. Download the Mobile Security and Risk Review for Q2 2016 here: www.mobileiron.com/securityandriskreview, and visit MobileIron at Black Hat in booth #1568. The report outlines several new mobile attacks which have emerged that threaten enterprises. Most are simply re-using old tactics against mobile-specific services, such as SideStepper’s use of Man-In-the-Middle (MITM) against MDM, rather than employing new techniques or exploiting new vulnerabilities. However, when attacks against users are successful, they can result in the loss of both personal and business data. Android GMBot: This spyware remotely controls infected devices in order to trick victims into providing their bank credentials. AceDeceiver iOS malware: This malware is designed to steal a person’s Apple ID. SideStepper iOS “vulnerability”: This technique was discovered to intercept and manipulate traffic between an MDM server and a managed device. High-severity OpenSSL issues: These vulnerabilities can potentially impact large numbers of applications and services, which could ultimately jeopardize enterprise data-in-motion. Marcher Android malware: This malware has evolved to mimic bank web pages that trick users into entering their login information through e-commerce web sites. Missing devices: 40% of companies had missing devices, up from 33% in Q4 2015. Out-of-date policies: 27% of companies had out-of-date policies, up from 20% in Q4 2015. 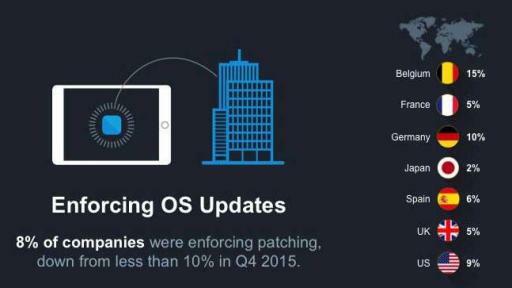 Enforcing OS updates: 8% of companies were enforcing OS updates, which was comparable to Q4 2015. App reputation software: Less than 5% of companies deployed app reputation software, which was comparable to Q4 2015. For the full list of trends, go to: www.mobileiron.com/securityandriskreview. 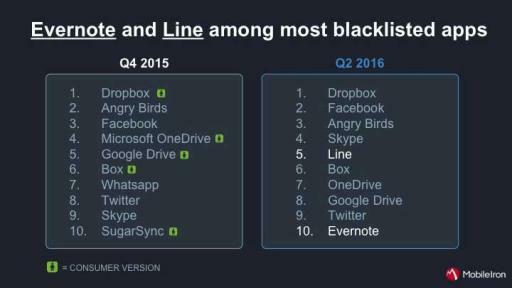 “When an unmanaged app that can potentially access corporate data or bypass corporate security measures achieves broad consumer adoption, IT departments look to blacklist it because they can’t protect corporate data in an app they don’t manage,” said Plouffe. Government organizations are known for having some of the most stringent security requirements. Paradoxically, extensive approval processes make it difficult for these organizations to keep pace with change, which can make them more vulnerable. Globally, Government organizations are less prepared to deal with security incidents than the global average. 61% of Government organizations have at least one non-compliant device, compared with the global average of 53%. 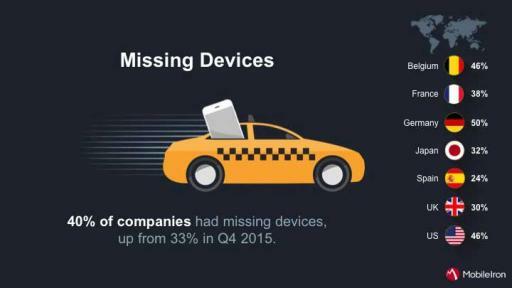 48% of Government organizations have missing devices, compared to the global average of 40%. 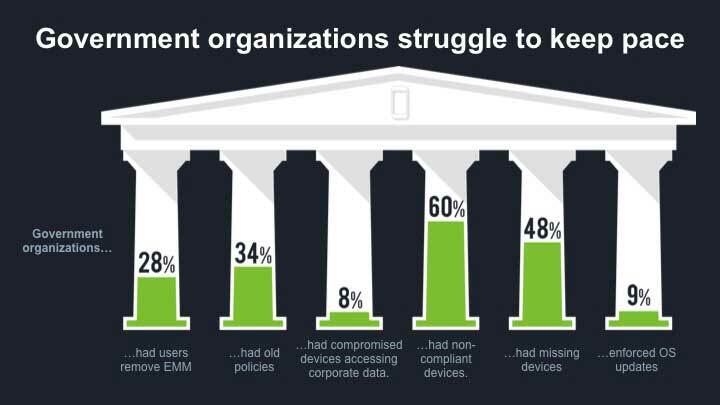 34% of Government organizations had devices operating under outdated policies, compared to the global average of 27%. The share of iOS devices grew from 78% in Q4 2015 to 81% in Q2 2016. 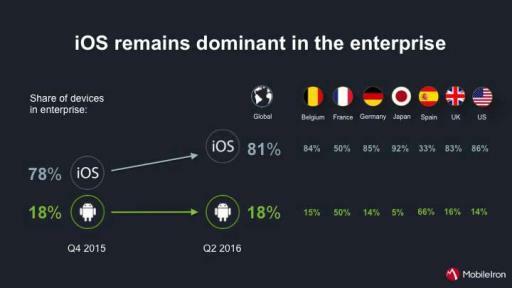 The share of Android devices remained flat at 18% during this timeframe. The second edition of the Mobile Security and Risk Review is based on aggregated, anonymous usage data shared by customers that was compiled from April 1, 2016 through June 30, 2016. MobileIron provides the secure foundation for companies around the world to transform into Mobile First organizations. For more information, please visit www.mobileiron.com.